Square Enix has released a new trailer for Kingdom Hearts 2.5 Remix, which allows you to compare the new HD version against the older SD version. The interactive trailer lets you switch between the HD or SD version, or view a side-by-side comparison of both versions. The game will be releasing on the PS3 on December 5th 2014. KIngdom Hearts. 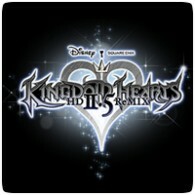 2.5 Remix will contain Kingdom Hearts II Final Mix, Birth By Sleep Final Mix, and Kingdom Hearts Re:coded.